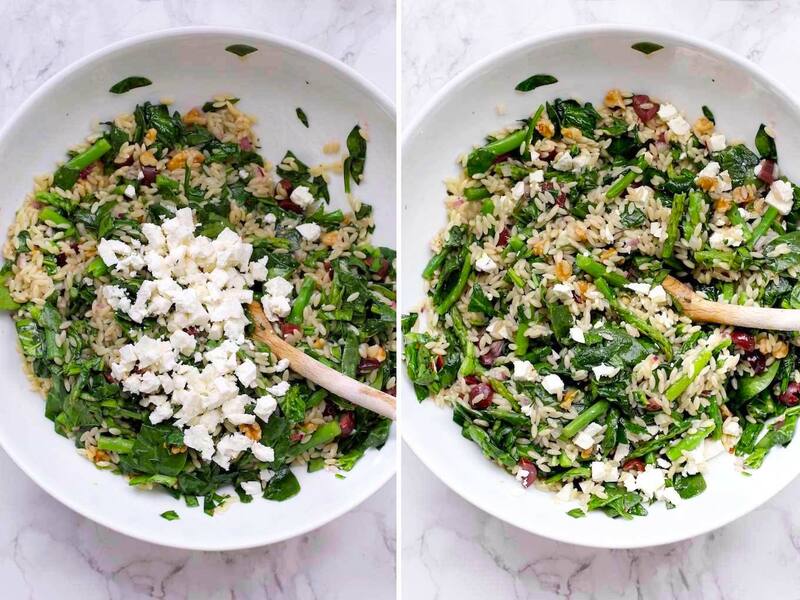 This orzo salad with asparagus and spinach is one of my favorite ways to serve orzo pasta. I make this orzo salad all the time – it’s quick to make, healthy and full of flavor – all my favorite things in a recipe. This recipe is super easy to make. 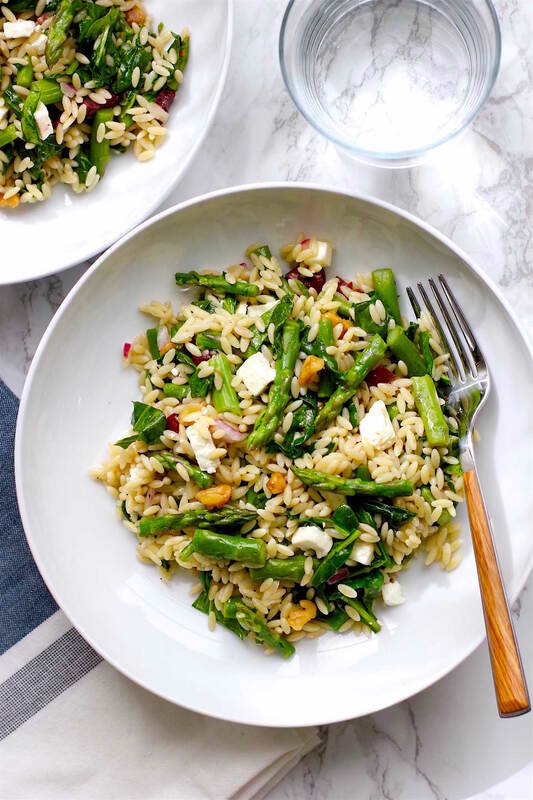 The orzo and asparagus are cooked together at the same time in one pot. When the orzo and asparagus are ready, they are added to the fresh spinach mixture and tossed until the spinach wilts. 1. 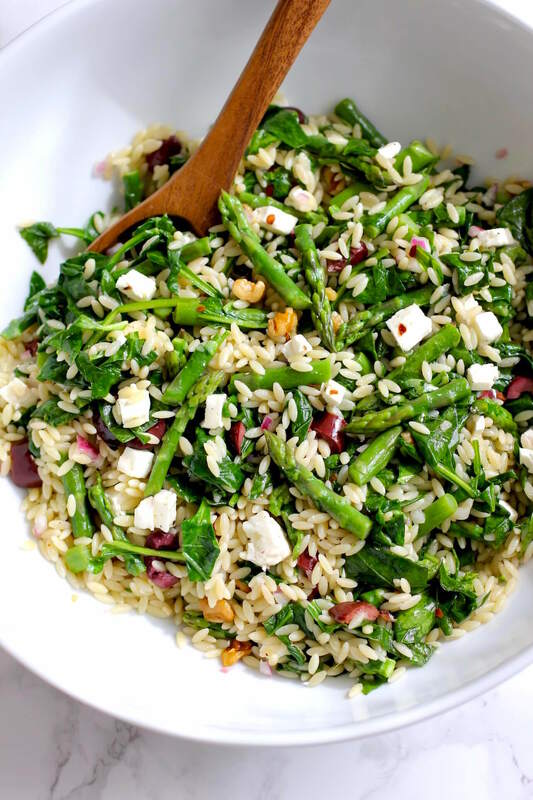 While the orzo and asparagus are cooking, add chopped spinach, kalamata olives, red onion and walnuts to a large bowl. Add half the dressing, stir to combine and let sit until the orzo and asparagus are done. 2. When the orzo and asparagus are ready, drain and add directly to the spinach mixture in the bowl. Add remaining dressing and stir the hot orzo, asparagus and spinach together for a minute or two until the spinach wilts. 3. Add feta cheese, gently stir to combine and you’re ready to serve. Want to add more veggies to this dish? Then try adding minced sun-dried tomatoes, sliced cherry tomatoes or marinated artichoke hearts. If you want to boost the protein in this dish, black beans or chickpeas would be a great addition. This recipe comes together quickly, so prep all your ingredients first. Having everything ready will make assembling this dish a breeze. 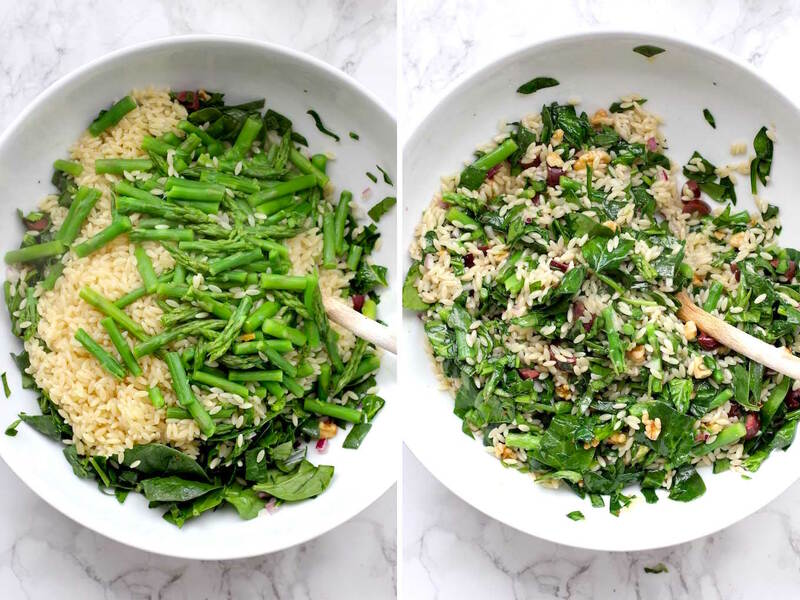 You’ll be using only one pot for this recipe – the orzo and the asparagus cook together in the same pot. You can make this orzo salad a day ahead if you want – it holds up well in the fridge. I love orzo salads since they are so versatile – it works as a main dish or a side dish. It’s good warm or cold. Leftovers are perfect to pack up for lunch the next day. I used the Dececco brand of pasta – their orzo is a bit smaller than regular orzo. But regular orzo will work just fine in this recipe. Orzo expands as it cooks, so it may not look like a lot when you first measure it out but it doubles in size when cooked. Orzo may look like rice, but it is a small oval shaped pasta that you can find in the pasta aisle at the local market. Are you looking for more spring recipes? Then try one of these reader favorites. What white wine vinegar did you use? Hi Kathy: I used Trader Joe’s white wine vinegar – but any brand from the market should be fine. I used balsamic vinegar in lieu of red wine vinegar. 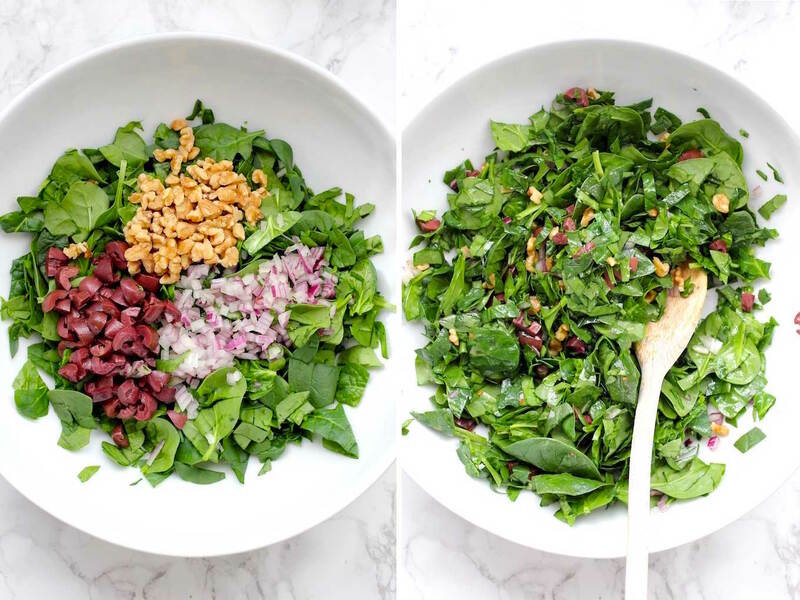 Switched toasted pine nuts for walnuts and arugula for spinach. Finally, added a chiffonnade of basil. Amazing result! 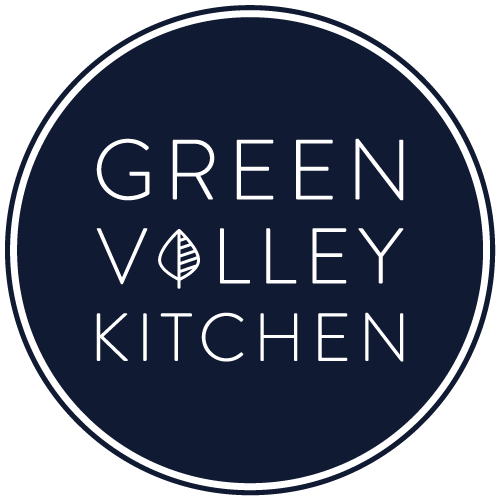 Hi Ginette – Love hearing how you changed this recipe up! Thanks for leaving a comment and a rating – I really love to hear from readers how they liked the recipe! It was amazing!!! I added some tomatoes I had on hand as well but it was perfect!!! It’s going to be my new go to salad!!! Hi Rosie – thanks so much for letting me know! I’ve been adding in tomatoes as well – you can change this up so easy – artichoke hearts would be a great add in also. Thanks for taking the time to leave a comment and rating – I really appreciate it! Just made this and am eating now, SO GOOD. The only change I made was no olives, a pinch more salt. Thanks so much, April. So glad you enjoyed it! I made this for dinner this evening. My husband and I loved it! I didn’t use the bouillon as I need to watch my sodium intake. I added a little sea salt and Mrs. Dash onion & herb to the water when cooking the orzo and asparagus. I would never have thought to cook them both in the same pot, great idea! I served the salad with fresh wild salmon. It was a delicious combo! I am anxious for my daughter to try this salad. She is a vegetarian and I’m always looking for quick meals she can enjoy with us. Thank you, it’s a winner!! Thanks so much for letting me know, Anita. So glad you and your husband enjoyed it – I’m sure your daughter will enjoy it too. If you have any leftovers, add some cherry tomatoes for an easy lunch! I forgot to give you my rating! Thanks so much for leaving a rating, Anita! Such a perfect summer meal! And I love that you added feta at the end. I’m gobbling asparagus every which way right now, and this way will be next!! Asparagus season is my favorite too, Sue! Hope you try it. I’m sooooo into orzo at the moment and this looks like it would compliment all those basic chicken dinners I’ve been making lately and maybe even bump them up a level from basic. Love this! Thanks so much, Aimee. Hope you try it! This is a fabulous recipe, the asparagus is bright green, the spinach melts into everything.The dressing is lovely and garlicky. Quite sensational. Lovely. I always cook pasta and veggies, or potatoes and veggies together in the same pot! So smart! The ingredients are incredible. I like the spinach and asparagus combo. Thanks so much, Mimi! I haven’t tried potatoes and veggies in the same pot – I’ll have to try that. I am loving this salad, Geraldine! 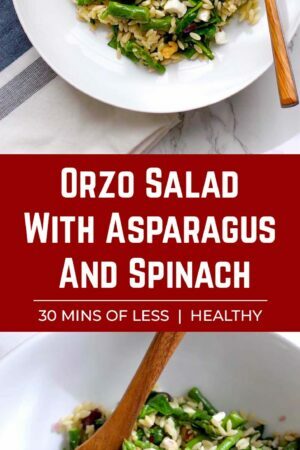 I’m a huge fan of orzo… and asparagus and spinach for that matter, so this is right up my alley! I wish I had this for lunch AND dinner today! This is definitely a MUST try! Cheers! Thanks so much, Cheyanne – I had no problem eating this two times in a row – lunch and dinner! Hope you try it. For the love of Orzo!! I completely understand, Geraldine! And this salad.. so versatile, so many ways to enjoy. I’m all in and you know would love to take this on a picnic with me! Delicious work so beautifully captured… Thank you for sharing! Lol, Traci – you made me laugh when you said “for the love of orzo” – that’s what I should have called this post! And yes to picnics! Hi Geraldine. Your delicious recipe caught my eye. I can’t wait to try it. I’m not used to making my own dressings, would I be able to substitute apple cider vinegar for the red wine vinegar? And is there a store-bought bottled dressing that could be comparable to the home-made for this recipe. Hello Geraldine! I haven’t tried apple cider vinegar so I don’t know how that would taste. There are some really good store dressings – I like the Annie’s Organics line. They have a red wine vinegar and olive oil vinaigrette – but I would add the crushed garlic and red pepper flakes as described in the recipe instructions. If you use store bought you’ll want about 4 tablespoons of dressing to cover the salad. Hope you try it! So happy I saw this just before heading out to the grocery store! I love orzo! And your mix-ins are making me very happy! De-lish! Hi Annie – glad the dish is making you happy! I’ve been seeing a lot of asparagus in the market (at a good price) and knew this was the recipe to share! Hope you enjoy it. This sounds so good Geraldine! I love easy, light and flavorful meals like this one! Asparagus is one of my favorites too. Love the kalamata olives and feta too! I’ll definitely be trying! Hi Mary Ann! I’m all for light and easy meals, too – especially fast ones – hope you try it and enjoy!